We learned in the prior post that Arlene has been murdered but Val is unaware. When she receives a telegram signed by Arlene asking for help at the Butcher Town bridge she rushes to meet her. ... a vintage photo ... Butchertown really did exist in San Francisco. It was an area in the Bayview neighborhood that housed all of the city's animal slaughterhouses and associated businesses. The photo below was taken at a slaughterhouse at 3rd and Evans Avenue (map) in 1921. Butchertown's prime (excuse the pun) was in the late 1800s through 1906 but it wasn't until 1971 that its last slaughterhouse finally closed. Then ... Val, driving Arlene's car, doesn't know that her sister's lifeless body is stuffed into the trunk. She heads down a steep hill on her way to the bridge. ... a vintage photo ... but the shot above was filmed not in San Francisco; this is Bunker Hill, Los Angeles. Below is a 1948 image of the same street, viewed south towards Olive St. from Grand Avenue down 2nd St. (map). CitySleuth recognized it from a couple of movies he has already covered: 1952's Sudden Fear, where Gloria Grahame meets a sudden end, and 1962's Days Of Wine And Roses where Lee Remick visits Jack Lemmon in the Chaspeak Apartments at 512 W. 2nd, the Victorian on the far right. ... and Now, this location looks completely different today after the Bunker Hill neighborhood was razed in the 1950s and 60s. Nostalgists like CitySleuth are grateful that the unique character of the old neighborhood can still be experienced in several old movies. 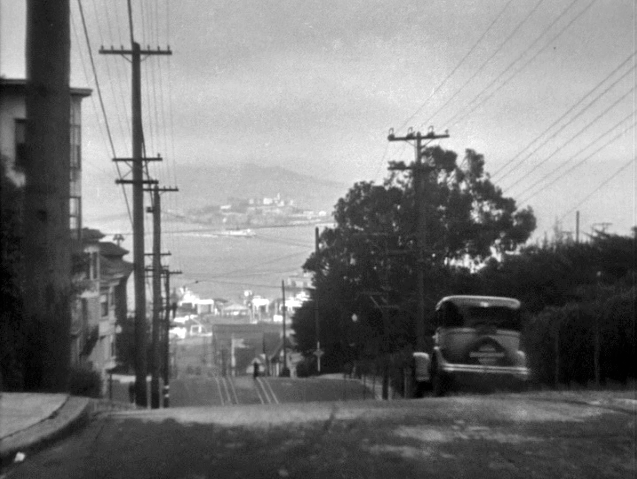 ... and Now, with Alcatraz in the distance this view down Hyde was filmed from Lombard (map). Turning 90 degrees to the right would have revealed Lombard's famous crooked street, constructed 12 years before the movie was filmed. Better had they sent the cab down there! ... it's Blazing Saddles, a bike rental store at 2715 Hyde Street. If you peer long enough at the Then image above, as CitySleuth would, you can see that this building and the adjacent one next to it uphill appear little changed for almost a century since being built in 1925. Then ... Val's father, alerted to Arlene's murder by the reporter, joins the frantic rush down Hyde Street in his limousine, filmed here from Francisco Street. ... and Now, back in the 1930s there were more cable car lines than nowadays but this, the Powell/Hyde line, is one of the survivors.